To service the growing need for efficient, reliable data communication in a harsh environment of utility substations and industrial facilities, has developed a 28800bps modem that can operate from various AC/DC power supplies and survive high surge levels and extreme heat and cold. All this without compromising the performance expected from state-of-the-art communication devices. With the rapid move toward “intelligent” substations, where meters, relay, RTU’s, SCADA systems, etc are able to “talk” to a remote operator, communication devices such as modem are moving off the desktop and into the field, where the conveniences of 115VAC power outlets and climate control are usually hard to find. Data Connect Enterprise has addressed this problem by developing the MIU PowerPort28.8 series modem designed specifically for harsh environments. The MIU PowerPort28.8 series modem is highly sophisticated full duplex, V.34 data modem that is designed to interface with RS232, RS485 (external device), 5V logic (TTL) or simple send and receive signals. 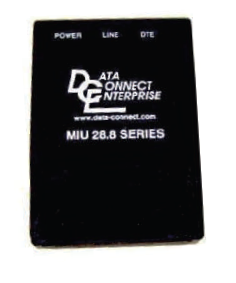 The MIU PowerPort28.8 series modem operates on a 2-wire Dial system. The MIU PowerPort28.8 series is powered through the RS232 (DB25) data interfaces port or External Jack. An optional 7-16VDC version is also available. A low Voltage version (9-36VDC) is also available. The MIU PowerPort28.8 series modem is designed to work in temperatures from 40°C to 85°C, and is surge protected on both the power and analog lines. Also see our Data Sheets on the “Myriad” Rack Mount Modem Banks, MIU202T (Bell), MIU9.6FPD and MIU14.4 and MIU28.8 modems. For Meters, Relay SCADA etc.